Sensual lips are the definition of beauty but maintaining them correctly moisturized seems like a full-time job for most women. 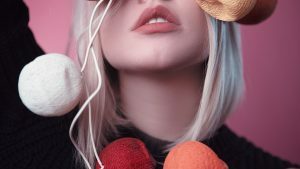 Unfortunately, many external and internal factors influence the color and the texture of our lips, so, if you want to keep them beautiful and full of desire, here are some things you can do. The biggest enemy of beautiful lips is coldness. And, while you cannot avoid low temperatures all the time, at least minimize the time you spend outside during the winter days. If it’s necessary to go out when it’s freezing, at least protect your body accordingly by using gloves, winter boots, and a warm hat. You can hide your lips from the cruel wind and snow under a scarf or a turtleneck sweater. Unfortunately, hot summer days don’t do your lips any good either. Harmful UV rays don’t only affect your skin but also your lips. Add wind, and you’ll have the perfect recipe for chapped and dry lips all summer long. Hide your hair and lips using scarves or large hats if you can and, if everything else fails, always apply a moisturizing lip balm with high SPF. You can find these in all drug stores or pharmacies and they won’t cost a fortune either. Another reason why your lips look chapped and dry is that you don’t drink enough water during the day. Up to 80% of our body is made of water, so we cannot stress enough the importance of staying hydrated. According to your height, age, weight, and lifestyle, you should drink anywhere between 50 to 100 fluid ounces of water daily, even more in summer. Keep in mind that most cold beverages you drink during the hot days contain sugar or alcohol which eliminate water from your organism. Therefore, if you want your body to function well and avoid dry skin and lips, you’ll need to drink an extra glass of water. Staying up late at night or having an active lifestyle are also factors that influence the water level in your organism. So, if you plan on running that extra mile or talking to your best friend until the sun rises, don’t forget to hydrate yourself accordingly. As strange as it may sound, licking your lips could cause more harm than good. While you think you are moisturizing your lips, don’t forget that your saliva contains a lot more ingredients than simple water. Therefore, when it dries, it will determine you to lose more moisture, causing your lips to become chapped and dry. Instead of running your tongue over your lips to hydrate them, you need to own at least one high-quality balm. Since lips are extremely sensitive, we suggest you avoid chemicals and opt for natural, organic moisturizers instead. Vaseline, organic coconut oil, beeswax or jojoba oil are just some of the ingredients you’re most likely to find in natural lip balms. If you want to use the same balm year-round, don’t forget to purchase one with a high SPF to protect you from the harmful UVA and UVB sun rays. So how do you know you applied enough moisturizer on your lips? Using a lip balm just once or twice a day may not suffice, especially during the cold season. If you spend a lot of time outside or often switch room temperatures, you may need to re-apply balm up to eight-ten times a day. Don’t forget to do the same operation after you’re done eating, drinking or kissing your beau. And, speaking of, if you plan on enjoying a romantic date, don’t forget to run a complete oral hygiene. Wash your teeth thoroughly using a regular manual toothbrush, then mouthwash and dental floss. Only after that, you’re ready to apply lip balm or moisturizer on your lips. As appealing as lip makeup products may seem, you shouldn’t use them on a regular basis. Lip gloss is harmful because it attracts sun rays, while lipsticks or lip stains will usually dry the lips due to their ingredients. If you want to keep your lips looking healthy and still enjoy a tint of color, you can opt for colored balms or applying lipstick after properly hydrating your lips. The color will be less intense, but at least you won’t have to deal with a dry mouth afterward.